Luxurious simplicity. Excellence in every detail. Made in Germany the Diplomat Esteem Pen range is a luxurious choice of exceptional quality. Multi-layered brilliant lacquer finished with matte chrome stainless steel body over an all-metal casing to ensures long-lasting, perfect micrometrical fittings, weight balance and shock resistance. Fitted with Diplomat’s king-size easyFlow black refill for smoothness. 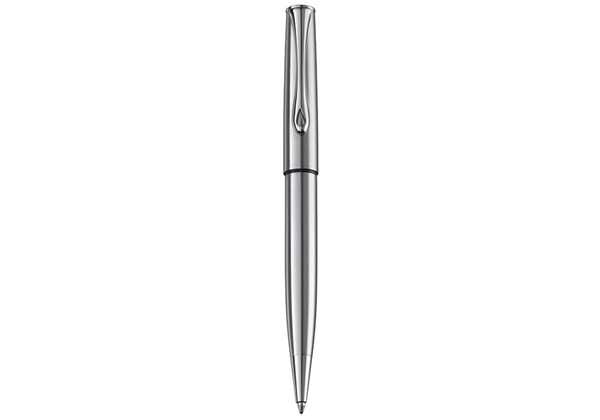 cap push mechanism, this Diplomat stainless steel ballpoint pen will allow your handwriting to glide across the page. The pen comes packaged in a Diplomat branded metallic presentation box with an International 5-year warranty. They make the perfect accompaniment to our handmade personalised journals. Diplomat has been manufactured using traditional methods of craftsmanship since 1922. It is the combination of exceptionally high-quality materials to ensure a perfect balance and impact resistance to all ranges. Diplomat writing instruments prove to stand the test of time and continue to share your stories. Full metal casing for to ensures long-lasting, perfect micrometrical fittings, weight balance and shock resistance. Ballpoint pen with cap push mechanism, Fitted with a medium king-size easyFlow Diplomat black refill.